Silence & Noise Designer Profile: L.O.R. Dorothy Mensah and Krista Pottinger are two best friends turned fashion designers from Northeastern who have turned a passion into a career. Their brand, L.O.R., has been successful enough to show at Plitzs New York City Fashion Week, as well as gain a wide following on Instagram. L.O.R’s line is focused on boldness: bold cuts, colors, prints, and is working on leaving a bold impression on the fashion industry as well. Haute Fashion: How did you become interested in fashion in general? Krista: Personally I’ve been interested in fashion since middle school. I didn’t pay so much attention to media, but I’ve always had my own way of dressing and my own way of doing things. Dorothy: My love of being different meshed definitely with hers. HF: What spurred you to create your own line, i.e. inspiration? Krista: African culture. We use a lot of kente cloth, and incorporate bold colors and cuts. We love to show a lot of skin; it’s all about being comfortable with yourself. Dorothy: The edginess of our clothes explain that. HF: How did you meet and what made you decide to work together? Krista: We met modeling at a Northeastern fashion show, actually. HF: What does L.O.R. stand for and where did the name come from? Krista: It came from the French word “l’or,” which means gold. It symbolizes strength and individuality. HF: Who is your customer? Dorothy: We don’t like to exclude anyone, but we mostly cater to young girls who like to go to parties, express themselves through clothing, and be different. HF: You showed at Plitzs New York City Fashion Week this February. How did you get there? What was the experience like? 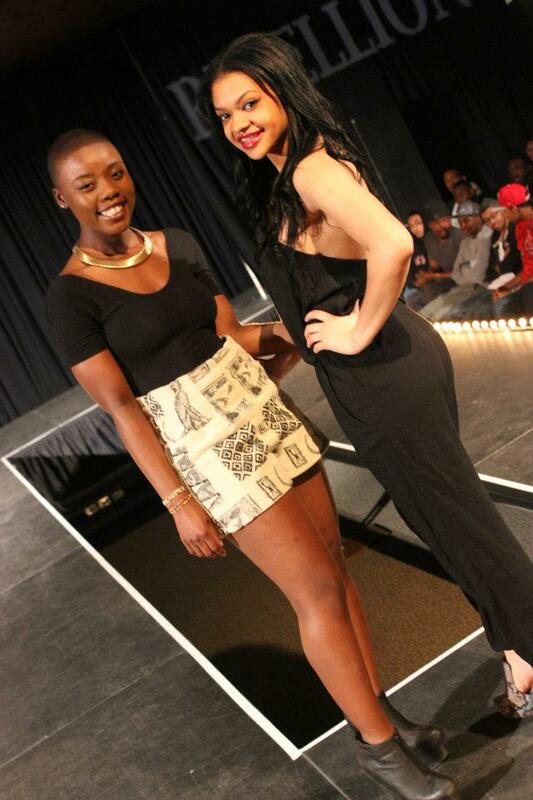 Krista: We saw a posting online and submitted photos from our first fashion show here at Northeastern. They liked it and we put our heads together and made a new line. Dorothy: It was tough and hectic, but a great learning experience for us as new designers. It taught us how to work under pressure. HF: How do you feel Northeastern prepared you for the fashion industry? What are your majors? How did your classroom and/or co-op experiences compare to breaking off on your own? Krista: As a Human Service major, you learn how to communicate with people, and how to help your customers figure out what they want and tend to their needs. Dorothy: I’m a Business major concentrating in Management Information Sciences, which has nothing to do with fashion. But you do have to learn time management. In fashion, you’re not going to go far without planning. HF: Are you guys working on any other projects, in terms of design? Krista: Right now we’re working on a spring collection, and a few pieces will be featured in the Face-Off Challenge, a competition for upcoming Boston designers. HF: So where do you see yourself after school? Dorothy: I think we’ll definitely keep pursuing fashion, but we don’t know where we’ll be in the fashion careers so we’re definitely going to continue with our majors. HF: Do you have any goals you definitely want to achieve? Krista: Eventually we’d like to move to New York and increase our brand awareness. Dorothy: It would be great to see our stuff in boutiques and online stores soon, and we hope to do more shows such as Haute Fashion’s Silence & Noise. It’s all about trying to get noticed.